Though horror movie fans haven’t gotten an outstanding franchise crossover battle since 2003’s Freddy vs. Jason, superhero movies have been at the forefront of bringing disparate characters together for some serious carnage. Upcoming films like The New Mutants and Spawn are courting horror fans by promising suspense and violence (refusing to shy away from previously taboo R ratings), but many don’t realize comics have been delivering terrifying crossovers featuring some of our favorite villains for years. With the pending sale of 20th Century Fox to Disney, the future of the Alien franchise has been called into question. Though we may never learn the fates of characters introduced in 2017’s Alien: Covenant, horror and sci-fi fans might want to explore the vast universe unfurled in numerous comics and graphic novels. Not only do they delve into the lives of characters only briefly seen in films, you can find some unexpected crossovers that make Alien vs. Predator seem uninspired. 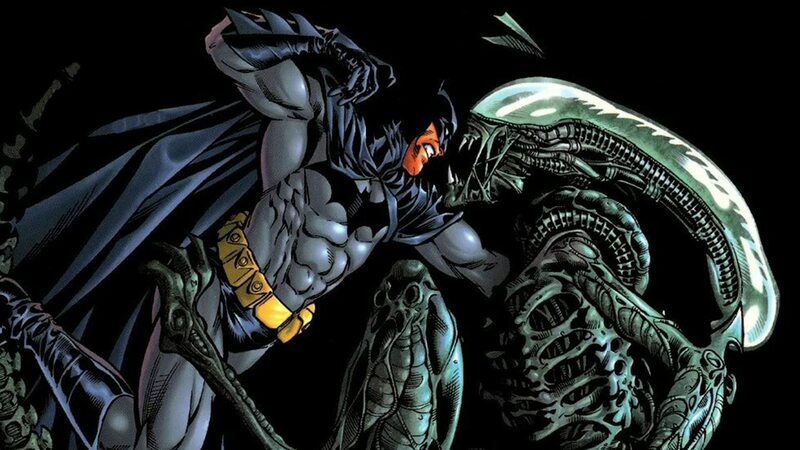 Superman and Batman are just the two most famous superheroes who have gone toe-to-toe with Xenomorphs in comics. Keep reading for a detailed summary of Alien franchise crossovers in comics. 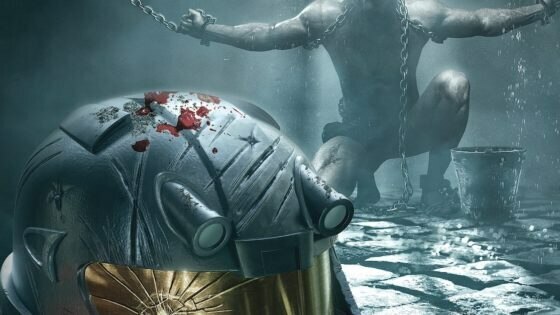 The Man of Steel first crossed paths with Alien’s titular extraterrestrials in a 3-episode series from Dark Horse Comics. Written and illustrated by Dan Jurgens, Superman vs. Aliens ran from July through September 1995. The story found Superman lamenting his isolation when a signal from deep space renewed hopes that there may be other survivors of Krypton’s apocalypse. His hopes are dashed, however, when he arrives at the decimated city of Argo, where a Xenomorph infestation has wiped out the once-thriving community. 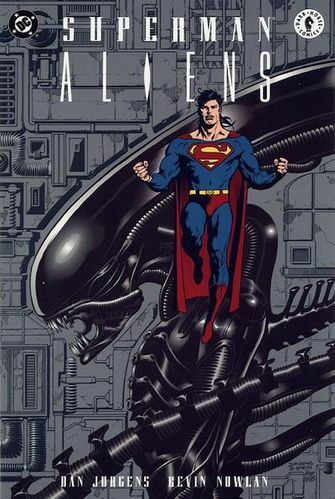 Deprived of the powers he receives from Earth’s yellow Sun, Superman must face the Alien Queen while seeking a cure for the Xenomorph embryo growing inside him! The Kryptonian would battle these fearsome foes again in Superman vs. Aliens II: God War in 2002; the 4-episode series from Dark Horse was written by Chuck Dixon and illustrated Jon Bogdanove. This time, Superman comes to the rescue when a renegade ship full of Xenomorphs crashes into the homeworld of The New Gods. In this series, Superman’s commitment to protecting all life is challenged, as he contemplates finding a suitable planet for the Alien Queen. 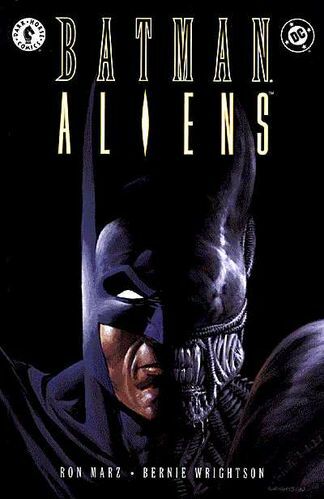 Dark Horse released Batman/Aliens as a 2-part series in 1997; it was written by Ron Marz and illustrated and inked by Bernie Wrightson. The Caped Crusader uncovers a Xenomorph threat while investigating Mayan ruins, leading to a confrontation unlike anything Batman’s ever faced before. The clash continued in 2002’s Batman/Aliens II, a 3-part series written by Ian Edginton and illustrated by Staz Johnson. This time, the Xenomorph plague hits Gotham, when a sealed vault reveals unsettling artifacts from a doomed mission to the South Pole. Mayhem reigns when face-huggers invade Arkham Asylum, where Batman must contend with a shadowy black-ops agency in addition to the relentless decimation caused by the Aliens. 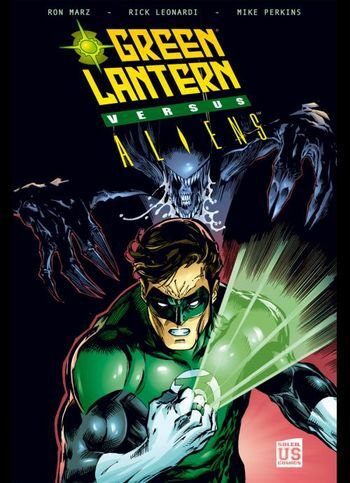 Green Lantern versus Aliens (2000) is actually a continuation of a series that saw several iconic superheroes battling Predator’s intergalactic bounty hunters—but that’s a story for another article! This 4-issues series (also from Dark Horse and written by Ron Marz and illustrated by Rick Leonardi) kicks off with a never-before-told chapter in the story of Hal Jordan, widely considered the greatest of those to have carried the Green Lantern mantle. Jordan’s decision to contain rather than destroy the Xenomorph threat will haunt his predecessor, Kyle Rayner, who joins a group of former Green Lantern Corps members to rescue residents of a planet overrun by Aliens. Ultimately, he must face the Alien Queen while struggling with the ethical consequences of annihilating an entire species, no matter how insidious it is—the same conundrum that tortured Jordan. 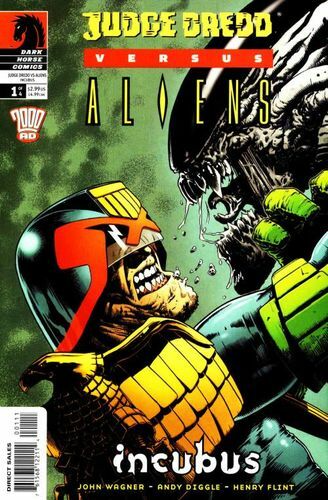 In 2003, the Xenomorph plague hit Mega-One City hard in the 4-issue series Judge Dredd versus Aliens: Incubus, a collaboration between Dark Horse and Rebellion Developments; it was written by John Wagner and Andy Diggle and illustrated and inked by Henry Flint. When the Alien threat emerges, Dredd first suspects there’s a connection to an underground fighting circuit, but this case will force him to seek the very origins of the nefarious species. In addition to protecting the residents of Mega-One, Dredd must also contend with an embryo growing inside him. 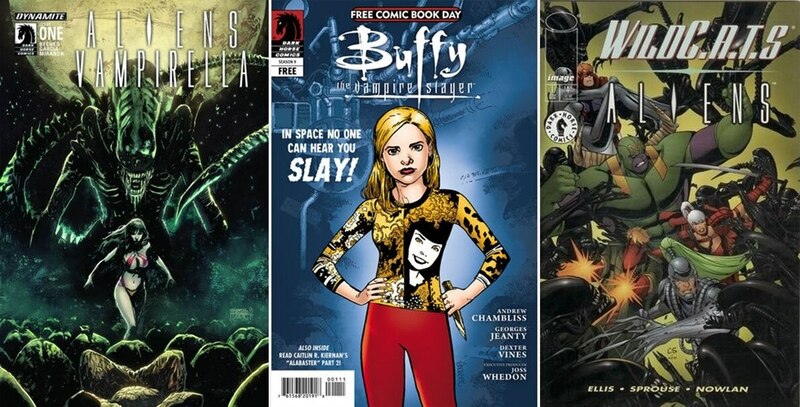 Other unexpected Alien crossovers that took place in comics worth mentioning include Buffy the Vampire Slayer: In Space No One Can Hear You Slay! Courtesy of (you guessed it) Dark Horse and released in 2012, an ill-advised “spacecation” finds Sunnydale’s savior facing off against the galaxy’s greatest scourge. The species’ acid-blood makes Buffy’s usual method of dispatch uniquely problematic! Back in 1998, the WildC.A.T.s crossed paths with horror fans’ favorite E.T.’s after an outer space escape pod crash lands in New York City. With StormWatch out of commission, the remaining team must rally all their resources to defeat an unprecedented threat in WildC.A.T.s/Aliens, a one-off first published by Image Comics, and later picked up by Dark Horse. Perhaps the most bizarre matchup occurred in 2012 when Vampirella battled Xenomorphs in a whopping 6-episode series published simultaneously in digital format by Comixology, Dynamite Digital, iVerse and (of course) Dark Horse Digital. Aliens/Vampirella takes place on Mars and also includes an ancient race of Martian warriors. As creative minds and artists continue to collaborate, we can expect many more unexpected crossovers in the years to come. Whether any of these comic book match-ups featuring Xenomorphs ever come to fruition in the form of feature films, however, remains to be seen (though it seems unlikely).